A natural herbal concentrate for the stimulation of both skeletal and visceral muscles, ciliar movement and amoeboid movement of macrophages and mast cells which generate cellular immunity. In the Energyvet Pentagram scheme, this product is a borderline product between the elements of Metal and Water. It acts through the activation of cytoskeleton and the production of proteins involved in the movement activities of the body. It exhibits natural anabolic effects. Bioinformation of the product-specific homeopathic type complements and potentiates the effect of the included herbs. The product stimulates the function of some organs and tissues belonging to the element of Water, i.e. the lymphatic system, immune system (cellular immunity), the urinary tract, and sexual organs. It stimulates the development and performance of both skeletal and visceral muscle mass (the intestines, stomach, oviducts, urinary bladder and all sphincters). It calms down excessive energy, hyperactivity of certain tissues of the element of Metal and Water, i.e. of the bronchi and the urinary bladder (in cases of incontinence). - Bacterial infections of the respiratory tract (cough stage), skin, lymphatic nodes, and inflammations of sexual organs in both males and females [Imunovet]. - Healing of wounds affecting the skin, soft tissues, bones and joints [Imunovet]. - Healing of fractures, wounded tendons and joints [Imunovet, Skelevet]. - Acts as an anabolic product, it stimulates muscular mass growth (necessary stimulation by training) [alternate with Gynevet]. - Young animal growth [Omegavet, Skelevet]. - Improved physical activity of female sexual organs (the womb, oviducts, ovaries) [Imunovet]. - Preparation for female fertilisation, healthy foetal development and completed gestation [alternate with Gynevet]. - Male fertility (stimulation of libido, production and maturing of sperms, ability to impregnate females) [Omegavet]. - Cardiac activity (in cases of weakened musculature, thinned wall, dilatation, ventricular widening) [Omegavet, Fytovet]. - The musculature of the stomach, gastric mills, the small and large intestine as well as the appendix ("lazy intestine") [Skelevet]. - Training-effect enhancement [Skelevet, Omegavet]. - Incontinence (sphincter musculature strengthening) [Skelevet]. - Cough accompanying lung inflammations (through the activation of the ciliar epithelium), chronic bronchitis [Imunovet]. - Bacterial infection (through the activation of macrophages) [Imunovet]. - Inflammation of the lymphatic nodes and lymphatic vessels [Imunovet, Skelevet, Omegavet]. - It attenuates the consequences of sadness-like stress combined with fear [Etovet]. In cases of pneumonia it is possible to use the product for as many as 4 times per day for the maximum period of 10 days. Shake well before use! Administration to older or severely ill animals should be restricted to 2 days only, followed by a 2-3 day break. This will prevent a temporary deterioration of symptoms – reverse reaction. Do not exceed the recommended daily dose! Ensure sufficient intake of water in the course of product usage. Not suitable for gestating females. Keep out of reach of children! It is not recommended to administer the product concurrently with Regavet and/or without at least one-week break between these products. I use Kingvet for speedier recovery after surgeries; for cases of chronic cough, particularly to suppress bacterial and viral infections. 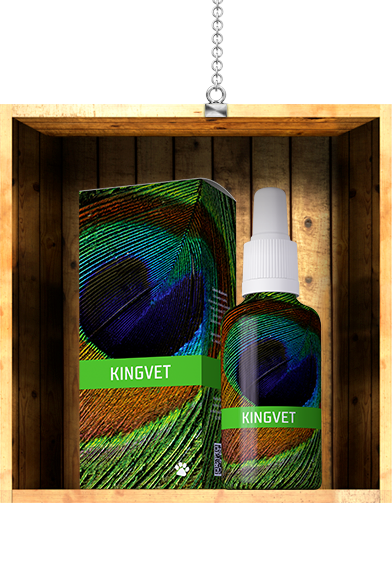 I use it also for older dogs with muscular atrophy, standing up problems – I begin with Kingvet administered for the period of two weeks, followed by a 14-day break, after which I apply Kingvet for twice three weeks with a one-week break.